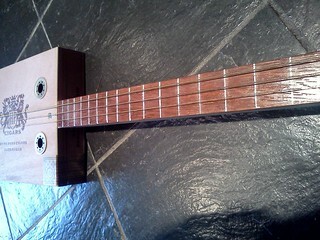 Dean W. Armstrong: Improvements on my first cigar box guitar build. 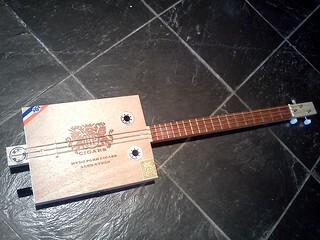 Improvements on my first cigar box guitar build. 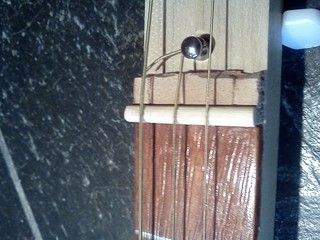 To improve my first cigar box guitar build, I added a piece of 2" x 1/4" mahogany mull casing (ripped to 1.5") to the neck. I sanded it multiple times and applied multiple layers of clear shellac to it. I glued it to the neck with wood glue (while clamping I ran into issues with ink bleed on my clamp softeners). Then I also added fret marks with a silver sharpie (which then smeared while trying to clean things). I also screwed the neck to the cigar box in two places hoping to eliminate some odd buzzing/high harmonics that were occuring. Some of them were coming from the nut and/or bridge because the strings were not fully engaged or trapped by a notch in the nut or bridge. For the nut and the bridge I used bamboo chopsticks, harder then the native wood used for the cigar box.